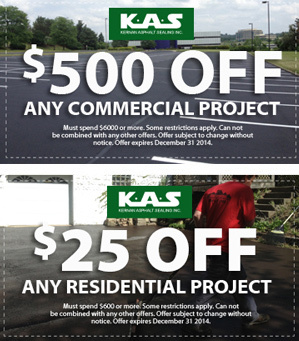 Kernan Asphalt Sealing is a 10 year plus old company dedicated to providing a cost effective solution for your pavement maintenance needs. Our wide variety of asphalt and coal tar based emulsions are formulated to your specifications. They can be custom blended to meet and exceed engineering standards. Our laboratory access constitutes the difference in the degree of professionalism over our competitors. This format allows for the standard sealer or a micro surface that renews and restores the pavement surface. Our experts can accommodate any budgeting prerequisites. All products are certified to be of the highest quality for your performance goals. Applications are completed with state of the art equipment. Our employees have background checks and work in a drug free environment. No job is commercially too big or small.